Last year was not ideal for me it terms of cycling. It wasn’t the people I rode with since they are all awesome. It was the style of riding. I got into cycling primarily because of the social aspect of it. The miles and hours of riding with friends is beyond appealing and a big part of why I ride. Somehow, in 2010 that didn’t happen. Instead, I spent a lot of time on rides that I like to call the “race to regroup”. This means that the rides were hard and fast to a planned regroup spot. Then, once everyone arrived, we would take off at a blistering pace to see who could get to next regroup the fastest. I enjoy doing these rides occasionally but I do not want them to be the norm. Add to this that I am right in the middle it terms of strength so I spent a lot of time riding solo – behind the faster riders and ahead of the slower ones. The end result? I finished the year very fatigued and needing a little break from the bike. That was the catalyst for bringing running back into my fitness plan this year. Of course, if I was going to run more, I needed a goal and that’s how I ended up participating in the Windsor Town Green Half Marathon last Sunday. My original plan was to make sure my running did not interfere with cycling. However, after getting a pretty nasty cold in February that put my training behind schedule, I was forced to cut way back on cycling in April and May as I played catch up. How far did I cut back on cycling? By this time last year I had ridden just over 1,700 miles. This year I have a grand total of 860. Surprisingly, there is a huge silver lining to what seems like a dark cloud. Throughout April and May, I found myself wanting to get on the bike but not having the time. I would be sitting at my desk thinking about how great it would be to ride after work. Then, on the way home, I would realize I really needed to get in a run instead. So, I would get home and cast a glance towards the garage where the bikes were patiently waiting my return. Then I would put on my running shoes and hit the road. This happened on numerous occasions and it started to create a real longing to ride that has been missing for a few months. I actually found myself getting upset that I couldn’t find the time to ride. I’m sure at one point I was wondering why the hell I decided to run a half-marathon in the first place. Finally, one day after work I decided “half marathon be damned,” I going out for a ride. Still concerned about the upcoming run, I decided to take The Vegas (my name for my single speed road bike) so I could do a nice easy ride with a high pedaling cadence. It was awesome!!! I did my best bike path pokey as I rolled along. The longer I rode the more I wanted to ride. I was reminded of how much I love cycling and it re-ignited a desire to do much more of it in the weeks to come. I can honestly say that Lee Alderman, the cyclist, is back. Now, with the half marathon in the bank, I plan on putting in some serious miles on the bike. I plan on jump starting my “more cycling miles” plan by riding all three days of the Memorial Day Weekend. Plus, our cycling group has shifted back to those of us who want to ride strong but also want to stay together and ride as a group, which is music to my ears. All I need to do now is clean the bikes, find my kits, and join the fun. Completely and utterly cracked . . . 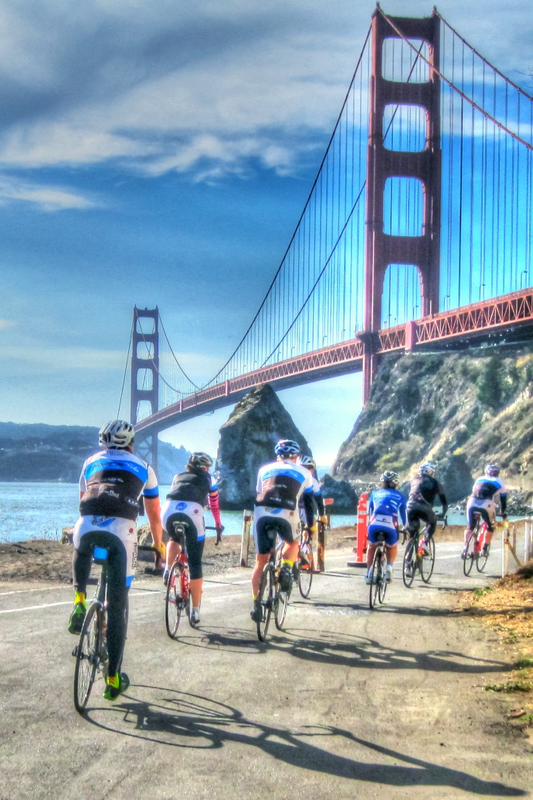 Here's a video of what it's like to cross the Golden Gate Bridge by bike!! !